Oh, dear God… just no!!! Oprah, according to the left, gave a passionate speech at the Golden Globes last night saying that sexual abuse stops right now, darn it! Right… like Oprah didn’t know that Weinstein was doing his thing for over 20 years with women in Hollywood. She’s using it as her cause du jour to launch her presidential campaign for 2020… or at least, that’s what it looks like. Celebrities are now lining up to beg her, and I do mean BEG HER, to run for President. SMH. These people do not seem to care that Oprah is a Marxist and from what I have seen, a racist. Think back — all the way back — to the Obama years and remember how she acted. I do. Hollywood stars took to social media last night as they rapturously fantasized about Oprah being in the White House. They just could not stop talking about her fiery acceptance speech for the Cecil B. DeMille Award at the 75th annual Golden Globes. Meh. But just in case you need to know: “For too long women have not been heard or believed if they dared to speak their truth to the power of those men,” she said to the black-clad star-studded audience in reference to Hollywood’s systemic culture of sexual misconduct. Those men? Isn’t that sexist, Oprah? And I might remind you that men vote. “But their time is up… Their time is up.” Do tell. “So I want all the girls watching here and now to know that a new day is on the horizon!” she belted. “And when that new day finally dawns, it will be because of a lot of magnificent women, many of whom are right here in this room tonight, and some pretty phenomenal men fighting hard to make sure that they become the leaders who take us to the time when nobody ever has to say ‘Me Too’ again,” she declared. It’s okay guys… you can be happy as slaves to these feminist women. They won’t beat you too much, I’m sure. Oprah, of course, got massive applause and cheers. She was given a standing ovation from those that attended the event at the Beverly Hilton Hotel. Stars cooed at her and fluffed her ego… they assured Oprah she could be the first woman president, ever. Left-wing comedian Sarah Silverman tweeted “Oprah/Michelle 2020,” apparently promoting a presidential ticket in 2020 in which former first lady Michelle Obama is Oprah’s running mate. If that happens, I may just give up the ghost. Meryl Streep wants Oprah to run for president because after her Globes speech, “she doesn’t have a choice.” You mean Meryl Streep who in 2012 referred to Harvey Weinstein as a god? That Meryl Streep? Comedian Larry Wilmore declared, “Oprah for President.” Actor John Stamos and singer Leslie Odom gushed over an Oprah presidency, as did others. I feel nauseous. Other celebrities poured praise on the OWN boss. If Oprah Winfrey ever becomes president, call it a night. Her politics will finish off what Obama started. I’m not kidding. She’s just that bad. Oprah’s speech was impassioned and forceful, and I don’t buy a single word of it. She’s anti-Trump, anti-conservative and I’m telling you, she’s a red Hollywood starlet. Oprah is not what this country needs and I’m afraid we would not survive her presidency. But hey… on the bright side… just like Obama, you’d have Hollywood partying in the People’s House once again. As America burns to the ground. 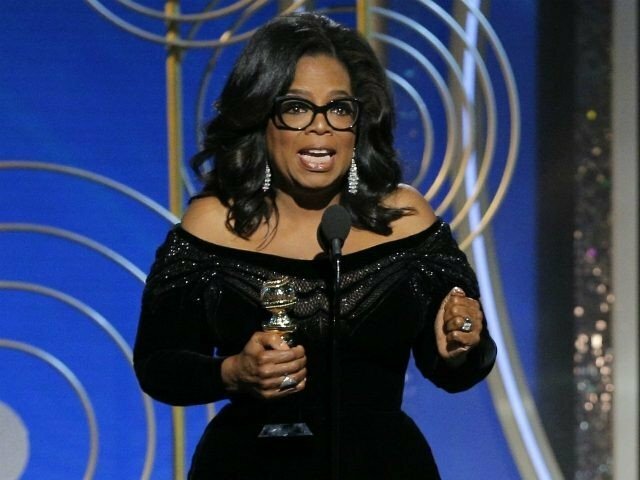 Oprah says she is not running, but dayum… that speech at the Golden Globes sounded like she was laying the groundwork for it. I guess we’ll see. Asked Meryl Streep what she thought of Oprah's speech. Her answer: "She launched a rocket tonight. I want her to run for president. I don't think she had any intention [of declaring]. But now she doesn't have a choice." As I sit here in tears…I have never ever seen such a speech. @Oprah, my friend. Please run for President. This world needs more of THAT. WOW. Oprah 2020!!!!! Best speech of the night!! Golden Globes. Enjoying the drama of Barbara Streisand relinquishing her seat back to Oprah Winfrey. It was a moment. And now I'm crying. Thank you @Oprah for nailing it once again.